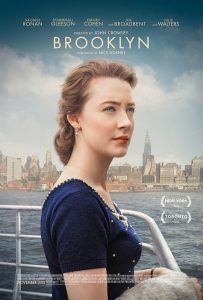 Brooklyn is a beautifully told story of Eilis (Saoirse Ronan), a young Irish woman who leaves her homeland to make a new life for herself in Brooklyn in the early 1950’s. With few prospects for herself in Ireland, Eilis leaves behind her mother and sister to sail alone across the Atlantic in search of a better life. The priest in her home town makes contact with Fr. Flood, an Irish priest in Brooklyn, who finds Eilis a place to live in a boarding house and a job in a department store. Eilis experiences seasickness on the ocean liner, then homesickness in Brooklyn. Eventually she meets Tony, a young man of Italian descent, and they fall for each other. Life takes an unexpected turn when Eilis learns that her sister has died unexpectedly and decides to return to Ireland to stay with her mother temporarily. While back home, she meets a young man named Jim, to whom she is attracted. Will Eilis return to Tony in Brooklyn, or stay in Ireland with Jim? One of the strengths of Brooklyn is the rich production design, including beautiful photography, sets, and costumes, transporting us to 1950’s Ireland and Brooklyn. In addition, there is the fine screenplay by Nick Hornby. Throughout the course of the film Eilis grows in confidence from the shy, homesick young woman who steps off the boat. Tony is definitely a charmer, who works at the family plumbing business and loves the Brooklyn Dodgers. It’s such a pleasure to see Saoirse Ronan and Emory Cohen together as the young couple. I hope they both receive Oscar nominations for their fine work. I also liked the sense of community that pervades Brooklyn. Eilis is part of a small town community in Ireland. When she arrives in Brooklyn, she becomes a part of a new community at Mrs. Kehoe’s boarding house. Even though the young women vie for the boys, they still go to dances together and advise the new arrivals on such things as what to wear and doing their makeup. Mrs. Kehoe watches over the young women with a stern, yet loving, eye. Fr. Flood’s church is the center of religious and social activities. He also watches out for Eilis and finds a benefactor to pay her tuition at a night school. Even Eilis’ supervisor at the department store gives her helpful advice and supports her through her first months on the job. A scene when Tony brings Eilis to his house for dinner indicates the same warm and funny family atmosphere in his Italian neighborhood. Perhaps Brooklyn sounds overly sentimental. Yet, I wish the strong sense of community life of these neighborhoods still existed in our time when so many people hunger for community. Brooklyn is a winner of a film in every way. It’s a good story, beautifully told, with attractive characters, with whom we can identify. (Who hasn’t felt homesick at some point in their lives?) I hope you’ll enjoy this gem of a movie as much as I did.